This lecture will trace crucial intersections between the Swiss art historian and architecture critic Sigfried Giedion (1888–1968) and a number of his Bauhaus colleagues, including Walter Gropius, László Moholy-Nagy, and Herbert Bayer. 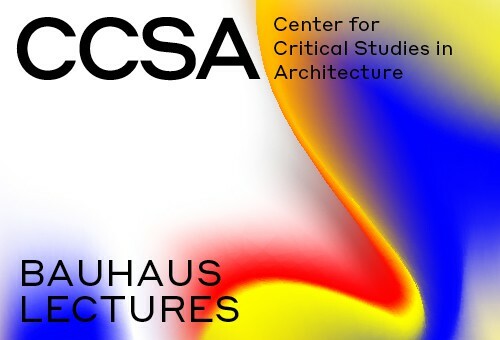 Following their migratory paths from London, to Cambridge, Mass., New York, and Chicago, I will shed light on the dissemination, translation, adaptation, and reinterpretation of Bauhaus ideas (and ideals) across the Atlantic. Based on insights from the American academic context in the postwar period, I will reflect how pedagogical ambitions and methodological approachesfacilitated to create awareness of cross-disciplinary scholarship and teaching to overcome the increasing tendency toward specialization, and to cultivate a universal language with which to describe the modern condition. The presentation will deal with a movement of architects from Europe to the Soviet Union during the interwar period. The presentation will partly focus on a group of architecture students from the German Bauhaus who followed Hannes Meyer to the Soviet Union in 1930 after he was expelled from the directorship of the Bauhaus: the Red Bauhaus Brigade. Several of these architects relocated before the war, and many returned to Europe after the war. The presentation will end by discussing how a larger movement of architects that moved East represent a different paradigm of migration from others of the same period. Reto Geiser is an architect and scholar of modern architecture with a focus on the intersections between architecture, pedagogy, and media. He is Associate Professor and Director of Undergraduate Studies at the Rice School of Architecture where he teaches history, theory, and design. In his book Giedion and America: Repositioning the History of Modern Architecture(Zurich: gta Verlag,2018), Geiser traces aspects of cultural transfer and transatlantic exchange in the work of Swiss art historian and architecture critic Sigfried Giedion. He is the editor of award-winning House is a House is a House is a House is a House(2016), Explorations in Architecture (2008), and Liberated Dwelling(2019) the first English translation of Sigfried Giedion’s seminal manifesto from 1929. Daniel Talesnik is a trained architect specializing in modern and contemporary architecture and urbanism, with a particular focus on architectural pedagogy and relationships between architecture and political ideologies. He was awarded a PhD by Columbia University in 2016 with the dissertation The Itinerant Red Bauhaus, or the Third Emigration, which describes a group of Bauhaus students that followed Hannes Meyer to the Soviet Union in 1930. Daniel has published Bauhaus-related texts, including a report on his dissertation in ABE Journal 11 (2017). He has several forthcoming texts including: ‚Architectural Analysis: an Itinerant Pedagogy,‘ from the proceedings of the Dust and Data Colloquium (November 2016, Bauhaus-Universität Weimar, edited by Ines Weizman); ‚Tibor Weiner: From the Soviet Union to South America,‘ from the proceedings of Hannes Meyer as Pedagogue Symposium (March 2018, Kassel University, edited by Philipp Oswalt). Since September 2017 he has been teaching at the Technische Universität München and is a Wissenschaftlicher Mitarbeiter in its Architekturmuseum.